My 29th year was an interesting one. I had a few normal months, then began the Natural Chef Program at Bauman College. Afterward, I had plans to finish up my externship hours quickly and get back to reality, but Bell’s Palsy had a different idea and put me out of commission for a while. I didn’t get to have the big 30th birthday party I wanted since I was still recovering, but I did have a nice dinner with close friends. Now, exactly halfway through my 30th year, I’ve decided to put some goals down on paper (or on my blog). Because I’ve given myself only six months, these aren’t lofty “see the Eiffel Tower” goals; these are things that I can realistically accomplish with some hard work. Some are things that have been on my to do list for too long, some are to move forward on projects I’ve been kicking around in my head, and some are just fun. Naturally, a few of them are cooking- and blog-related so I figured posting here would be relevant, plus publishing the list will hopefully hold me accountable. I’m currently recovering from a strained lower back, so some of the health goals seem a little intense from where I’m at right now, which is on the couch with a heating pad. I’ll update as I cross items off the list. Hike to the peak of Mount Tamalpais. Work up to ten real push ups (not on knees). Borrow a foreign cuisine non-vegan cookbook from the library and try at least three recipes. Advertise personal chef services at discounted rate. Register for Vida Vegan conference. Invest in some props for food photography and take more interesting pictures. Finalize the list of songs for cover album project and start to think about style/arrangements. Plant herbs in the flower box. Get a few houseplants and try to keep them alive. Learn some basic conversational Spanish. Visit a city I’ve never been to. Take an SF City Guide walking tour. Go to SFMOMA or the de Young. 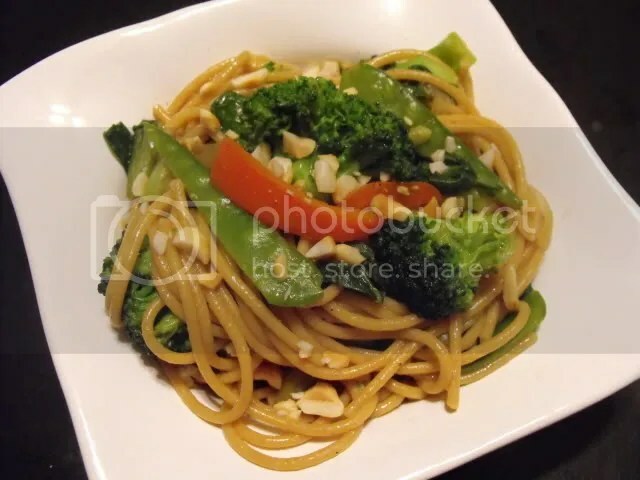 This is the Spicy Asian Stir-Fry with Whole-Wheat Linguine from Vegetarian Times. To be honest, it wasn’t very spicy, but it was a good, simple stir-fry, and it used up the bok choy from my CSA delivery. I tend to make all my stir-fries the same way and serve them over rice, so this was a nice change of pace.